Talking about the sales figures for Crysis, and thinking about the amount of time and energy that the folks at Crytek put into the game reminded me of a casual game company I read about on Kotaku this morning. After finishing up work on the Hitman series, a bunch of the developers left IO Interactive and started a new company, The Game Equation, to work on casual games. Much like God of War’s David Jaffe, they decided that spending years of their lives working on one game which may or may not succeed was not for them. So now, a small group of people work on quick, simple games, designed to sell many copies at a low price. I have to say, there is a certain appeal to that. Get the idea polished and done, with minimal risk. They seem to have two games available right now, both with a demo. Deep Blue Sea will be extremely familiar to anyone who’s played Puzzle Quest or Bejeweled. 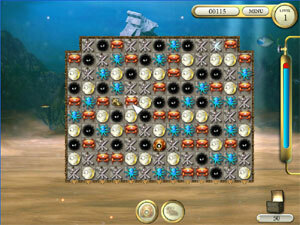 The goal is to guide your diver to the bottom of the screen by clearing out sets of 3 matching tiles. Every turn you may swap two adjacent tiles, if doing so creates a set of 3 matching tiles in some way. The twist that Deep Blue Sea brings to the genre is that some tiles, when cleared, will provide you with money you can use to buy upgrades to take into the next level. Things like a larger coffer, and special weapons for clearing tiles in rule-bending manners. Constellations is more interesting to me, as it has a newer gameplay mechanic. You’re dropped in the middle of a multi-coloured starfield, and you have to create links of stars in a specific sequence in order to proceed deeper into the field. 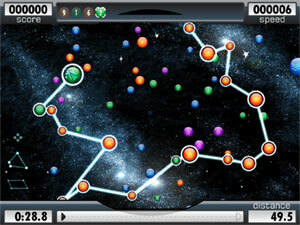 The stars you choose can be located anywhere on the screen, but each star you select draws a beam to the previous star, and you cannot choose a star that would link through a previous beam. Fulfilling the requirements for a 3-star chain is easy, but I can imagine how a sequence of 20 stars would prove challenging. A secondary mode has you building chains as quickly as possible in a race to the end of the level.